Television actor Nia Sharma, last seen in Khatron Ke Khiladi 8, had recently posted a string of pictures from her Halloween celebrations. And one thing that caught everyone's attention in the images was her unusual lip color which was a bold blue hue. But it looks like fans didn't like Nia's bold move as much because the actor has been facing incessant trolling on her posts till now. Nia shared a picture on Instagram with the caption, "When someone asks me to go easy on my choice of lip colors," adding the hashtag, "subtle look." Soon, the feed was flooded with comments like, "Looked like you accidently swallowed ink pen," "It's not looking good," and "Looking so ugly. Don't try these, doesn't suits on you." 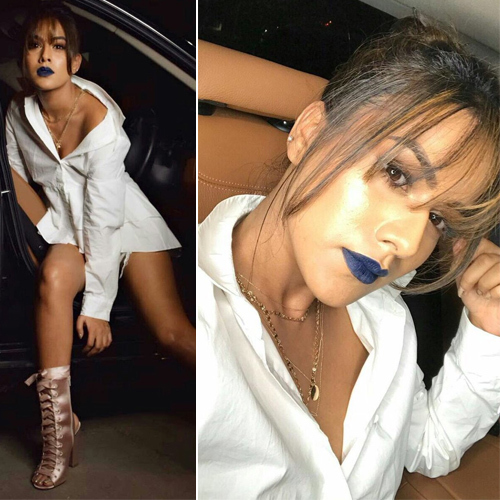 Nia Sharma, 27, wore a white shirt dress and apart from the blue lipstick, she accentuated her look with golden trendy chain.